I mentioned in yesterday's post that granite countertops are on their way out (or have been for quite sometime) - they've been around since the 80's and can really make a kitchen look dated. So what other options are out there for your kitchen counter? Turns out, there are many great alternatives. So many of my clients gravitate toward granite, mainly because it's what almost everyone uses in their kitchen, but also because they aren't aware of what other wonderful materials are out there. One of my favorites - CaesarStone Quartz Surface. Available in a wide range of colors and textures (a select few shown above). 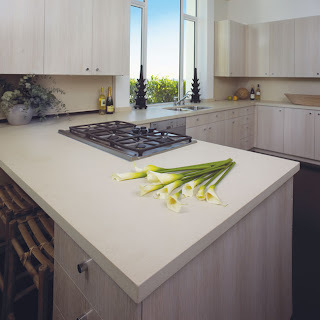 Caesarstone island from the Concetto collection. 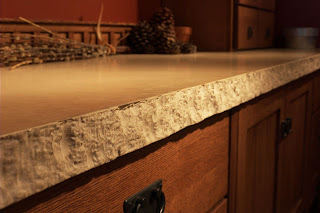 Caesarstone top with a chiseled edge - great for a more rustic look. Available through 3-Form Material Solutions, 100 Percent® is made from "100% post-consumer recycled high density polyethylene. With over 1000 milk bottles going into each panel, it can help projects earn up to 2 LEED credits for recycled content." 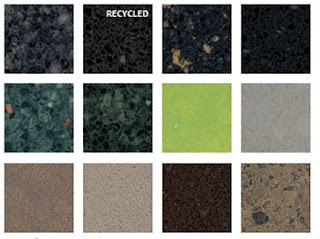 Above - a few samples of the colors and patterns available in the 100 Percent material line. 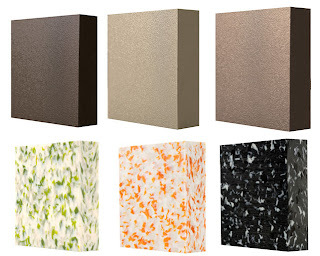 I've never been a big fan of Corian, but after doing a little research, I discovered they have some pretty decent color and texture selections, as shown in the photos above. 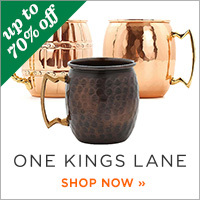 Click here to view more of their product. Soapstone is a metamorphic rock . "Although soft, soapstone is a very dense (non-porous) stone; more so than marble, slate, limestone and even granite. 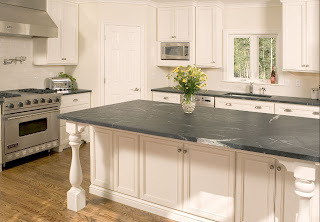 Since soapstone is impenetrable, it will not stain, no liquid will permeate its surface. 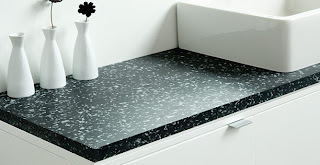 Other stones, including granite, have a propensity to soil; this is why soapstone (steatite) is widely used in chemistry lab countertops and acid rooms." 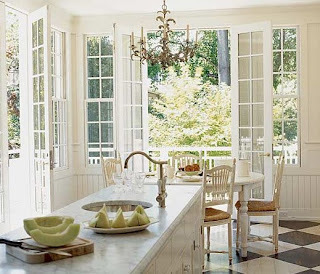 I love this bright and airy kitchen and nook. The soapstone reminds me of honed marble - it's beautiful. oh man! thanks for all your research... we need new counters badly. currently we have ceramic tile and while it looks pretty - it's not very functional! Hey Julie, very informative post today. Keep up the good work. Love this post. Can't believe the last kitchen picture is soapstone! My mom has caesarstone in her retro kitchen and it looks great. It's really durable as well. How timely. We've just finished restoring our old Dutch Colonial..., well, with only the kitchen left to do. This is the fun part though. We were thinking about concrete tops, but the 3-form solution sounds very interesting, and I want to look into that (hope it's not more expensive than granite though). Love the looks of the one pictured. Great ideas and selections - I didn't realize all the alternatives! I currently have Corian counter tops. My husband and I have have been discussing changing it in a few months. 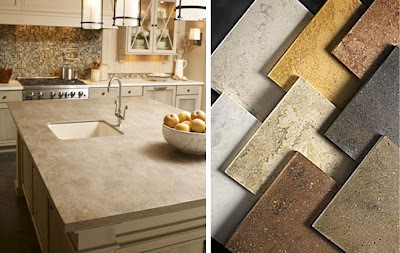 We have been doing a little reasearch and the Caesarstone is on our list.. Thanks for the info Jules! 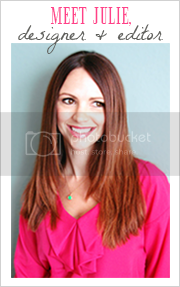 great info & tips! i LOVE the 100 percent material & would totally use it if i were to redo my kitchen. hope you are doing well! This is fantastic! I am going to be moving soon and desperately want to change up the kitchen counter to some kind of hard surface that is not granite. So, thank you for this! I will definitely be using it as a resource. 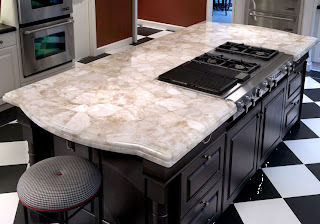 I love those chunky counters made of stone...I got white SILESTONE in my kitchen and I love it. It makes the kitchen look amazing! We just installed Zodiaq quartz and LOVE it!